The point is that businesses pay low wages in order to maintain higher profits. As the founding father of free market economics Adam Smith explained back in the eighteenth century, the ‘Butcher, the Brewer, and the Baker’ set up shop not out of some benevolent desire to put food on our table [or to create jobs], but in order to make a profit. So the short-term impact of raising the minimum wage (for companies with over 25 employees) will be a slight reduction in the profit margin of business owners and corporate shareholders. As to the myth that this modest raise in the wages of our lowest paid workers will lead to a significant loss of jobs, it’s simply not true: A review of 64 studies on minimum wage increases found no discernible effect on employment. Additionally, more than 600 economists, seven of them Nobel Prize winners in economics, have signed onto a letter in support of raising the minimum wage. As to the myth that it will lead to a significant increase in the cost of goods or services to the consumer, I would remind you what most of us were taught in the elementary school, that prices are based on supply and demand, the most fundamental concept of economics and the backbone of our market economy. If business owners could charge more, they’d be doing it now. In Eureka, the largest number of employees earning minimum wage work for multi-national corporations including McDonald’s, Walmart and Target. The prices at these large chain stores are generally set at corporate headquarters and not store to store and their profits are considerable and they can in fact afford to raise their wages without raising prices or laying off workers. McD’s for examples makes over $5 billion in profit from revenue of over $27 billion per year and their CEO was paid $13 million dollars (that works out to over $9,000 an hour) last year. And before you help these liars dry any more of their crocodile tears over their threatened “cost” to us the consumer of raising the minimum wage, you might want to consider the cost to us, the taxpayer, of NOT raising the minimum wage. You see us taxpayers subsidize these corporations in the form of public assistance.In fact McDonald’s used to run what they called “The McResource phone line” where they advised their employees on how to apply for food stamps. Workers with increased earnings would pay more in taxes and receive less in government benefits, that you and I pay for, so we would no longer be subsidizing their employers. And as the City of Eureka relies on sales tax and not income tax for the bulk of its revenue, when you raise the pay of low income workers, 100% of that money gets spent, versus when you give it to shareholders and well-off business owners, who even if they live in town are not likely to increase their spending. As an example, last year McDonald’s spent the equivalent of $14,286 per restaurant worker employed by the company on “share repurchases” and dividends. That was $6 billion in one year spent to profit shareholders, while employees are paid minimum wage, which at its current level has a purchasing power of 20 percent less than it did in 1968! Look, whenever profits are threatened, business always scream “JOBS.” If you’re old enough, you may remember that requiring seat belts in cars were going to cost us jobs! Any increase in the cost of doing business is always fought with the myth that it will cost jobs, but myths are just that, and the truth is employers will hire as many workers as they need to meet the demand of the marketplace. No more and no fewer. Then of course there is the moral argument, that if a man or woman does an honest day’s work, they deserve an honest day’s pay, and that would be a wage one could live on. 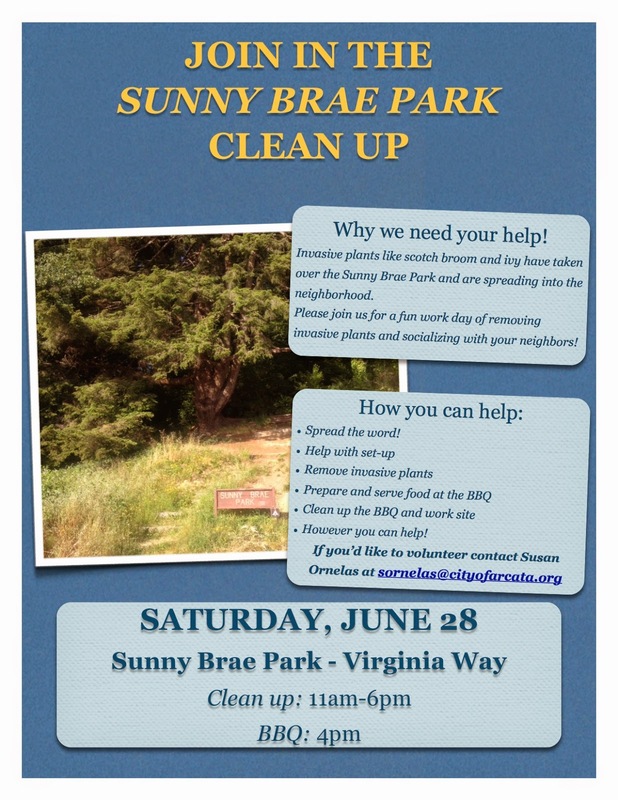 Please come out to Virginia Way between Beverly Dr and Charles Ave to pitch in! For over a decade Rob Arkley had tried to win control of Humboldt County politics. He has funded candidates and of course his wife ran for office. He formed lobbying groups like Humboldt Sunshine and most notably, HELP (Humboldt Economic & Land Plan), which intended to steer the future of land planning and of course that starts with the General Plan. Well apparently the voters of Humboldt County didn't want the local billionaire deciding the future of the community for them and they pretty much voted against all the candidates Mr. Arkley put forward, including his wife Cherie, ...though she only lost her bid for mayor by 42 votes. What happen next was this group that ostensibly had no connections to Rob Arkley and was run by a guy with a pony tail and a beard (Lee Ulansey), called HumCPR sprang up on the heels of the code enforcement debacle and with their financial backing the "gang of four" was swept into office. These Supervisors then proceeded to appoint commissioners to the Planning Commission. Well low and behold but we find out in the Northcoast Journal article that the majority of these newly appointed commissioners list membership in HELP on their resumes!? Is it possible that if Rob had just grown a beard and a pony tail, that he could have done this his own? That's unlikely, but in the end and through the unholy alliance that HumCPR has cast between developers and so called "back-to-the-landers", they were able to do what Rob Arkley was never able to do on his own, and was to put his lobbyist in control of Humboldt County. The voters of Humboldt will get one more chance to change that dynamic on Tuesday. We'll see what they do. Let me remind you that past elections in Humboldt County have been decided by just a handful of votes. Peter LaValle beat Cherie Arkely for mayor by 42 votes and lost four years later to Virginia Bass by just 65 votes , Jeff Leonard won an election with just 28 votes. Sundberg beat Cleary by 154 votes. So know that in Humboldt County, your vote does count!